Regional airline Flybe has cancelled dozens of flights on Wednesday morning for what it describes as "operational reasons".Five flights from Belfast City Airport and four from Birmingham are among those affected, along with departures from Southampton, Aberdeen, Edinburgh and Newcastle.Most of the flights are within the UK. The airline said it would like to "sincerely apologise for any inconvenience caused". "All customers affected have been emailed and advised they can rebook for travel on an alternative flight or apply for a full refund," the company said in a statement. Customers vented their frustration on social media. 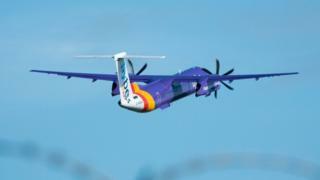 The Exeter-based regional airline put itself up for sale last November, following a profit warning the previous month.Virgin, Stobart Air and Cyrus Capital set up Connect Airways in December.Flybe fell into difficulty in 2017, after what was considered a too-aggressive expansion strategy. The company ran up a near-?20m loss in the financial year ending 31 March 2017.